Ever get a twinge or a pain that you’re not quite sure about? You don’t remember moving the wrong way, but for some reason, it hurts. Take right shoulder blade pain, for example. When you get right shoulder pain, often the first thought is that you just stretched a muscle the wrong way. But if you determine that it isn’t a stretched muscle, you may rack your brain trying to figure out what else it could possibly be. As it turns out, right shoulder blade pain has a number of causes. In this article, we’ll discuss the various causes of right shoulder blade pain, how to get rid of that shoulder pain, and when you should see a doctor. There are many causes of right shoulder pain. Some of these shoulder pain causes are obvious. A strained muscle, for example, makes sense. There are a lot of muscles in the back; in theory, it’d be easy to twist one. But there are a number of causes of right shoulder blade pain that might surprise you. A number of liver diseases can cause right shoulder blade pain. Infections and inflammation of the liver can cause the liver to press against the spots to cause the pain. Cirrhosis of the liver can cause a fluid buildup that can also cause right shoulder pain. The liver is located under the right rib cage, so the pain can easily radiate into the shoulder blade. Due to its location in the upper right abdomen, an attack of the gall bladder and gall stones can send pain to your right shoulder blade. The heart is an engine that powers the car that is your body. 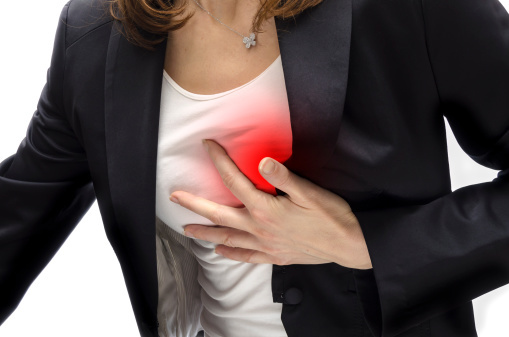 For this reason, a heart attack can send pain throughout your entire body. But due to its location in your chest, a heart attack can also send a fair amount of pain to your mid-back and right shoulder blade areas. Breast cancer, unfortunately, can spread from the breast to other places in the body. Those suffering from breast cancer may start experiencing right shoulder blade pain. There’s a very good chance that your work space or desk setup may be causing you that right shoulder pain. It may be something as simple as the height of your chair in relation to where the mouse for your computer sits. Bad desk ergonomics can cause pain in the back and shoulder area. Along with your workstation, another prime cause of right shoulder pain is bad posture. Sitting incorrectly or lying down weirdly can cause right shoulder pain. Luckily, there are a number of ways that you can curb this right shoulder pain. The good thing about right shoulder pain is if it’s caused by a muscle issue of some sort, the pain can usually be resolved easily with various sore shoulder treatments. Some of the other causes may require medical intervention to resolve. In the case of bad posture and ergonomics, you can make a solid effort to change. For your workstation, research proper ergonomics and change your desk or workstation appropriately for your height and weight. Stretching can help immensely. Overhead arm stretches, wall stretches, and arms behind the back stretches, in particular, can help loosen up the shoulder muscles. This can not only help rid you of the pain, but it can also help you prevent the shoulder pain before it begins. As with any muscle discomfort, a good way of getting rid of right shoulder pain is to rest it. Try not to overuse or put pressure on the muscle and just rest it for a few days. You might be surprised at how often that works. Along with the rest, heat and ice can work to loosen up the muscles and repair any minor damages. An anti-inflammatory drug such as aspirin can also help with any muscle pain or aches and help reduce the inflammation of the muscle if that is the issue. Unfortunately, for issues like gallstones, your best option is to try and rid yourself of them. While there a number of natural remedies that may help you get rid of the stones, surgery may be needed to remove them. As a general rule, if you are concerned about the pain in your right shoulder blade, don’t hesitate to see a doctor. It’s better to be overly cautious than to catch something too late. In the case of breast cancer, if you are suffering from disease and begin to have pain in your shoulders, see your doctor as soon as possible. The shoulder pain could be a sign that your cancer has spread into other systems. If the shoulder pain is accompanied by symptoms like chest pain or shortness of breath, it may be a sign of an underlying condition. If the pain does not go away or lessen after some of the above treatments, it’s best to get a doctor’s opinionto diagnose what the actual cause is and set you onto a path to get rid of that right shoulder blade pain quickly. Right shoulder blade pain happens. It’s what causes that shoulder pain that should be a concern. Hopefully, it’s just an achy muscle that you didn’t stretch enough or slept on the wrong way. It could also be more—a symptom of something else going on within your body. If you do have a pain in your right shoulder blade, keep an eye on it; if it’s prolonged, get it checked out. “Right Shoulder Blade Pain,” MD Health, March 10, 2017; http://www.md-health.com/Right-Shoulder-Blade-Pain.html, last accessed March 10, 2017. Eldridge, L., “Shoulder Blade Pain,” Very Well, November 11, 2016; https://www.verywell.com/shoulder-blade-pain-possible-causes-and-diagnosis-2248942, last accessed March 10, 2017. Andre, D., “Right shoulder blade pain causes and treatment,” Bel Marra Health, June 08, 2016; http://www.belmarrahealth.com/right-shoulder-blade-pain-causes-and-treatment/, last accessed March 10, 2017. Chris, “Sore Shoulder Treatment: Relieve the Pain With 5 Stretches,” Calorie Bee, February 15, 2017; https://caloriebee.com/workout-routines/Cure-Sore-Shoulder-Blades-With-Stretches, last accessed March 10, 2017. Mark, “Shoulder Blade Pain: 10 Ways to Get Rid of It,” Posture Direct; http://posturedirect.com/shoulder-blade-pain/, last accessed March 10, 2017. Modric, J., “Shoulder Blade (Scapula) Pain,” eHealthStar, November 25, 2014; http://www.ehealthstar.com/shoulder-blade-pain.php, last accessed March 10, 2017.